The rupee has lost 32 paise, or 0.50 per cent, in five trading days. In line with equities, the rupee recovered from initial losses, but still ended lower against the US dollar by tumbling 20 paise at 63.84 due to the looming debt default crisis in Greece amid month-end demand for the greenback from importers. Gaining some ground, the rupee recovered against the euro at 70.97 from 71.25 previously but fell against the pound sterling to 100.29 from 100.09 earlier. 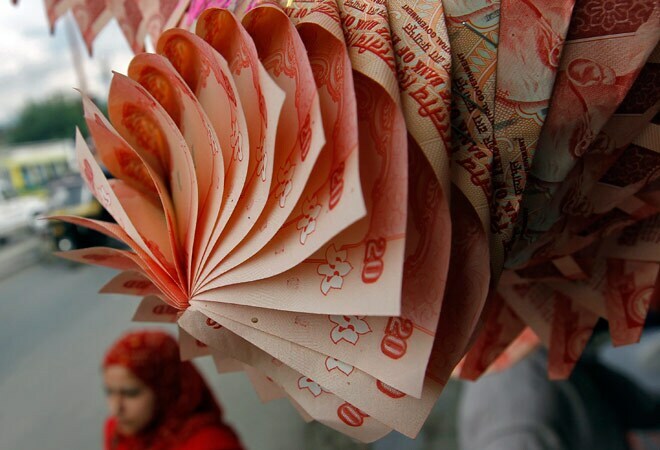 The domestic unit opened lower at 63.80 against the US dollar at the Interbank Foreign Exchange (Forex) and dropped sharply to 63.94 on heavy demand for the American currency before ending down by 20 paise, or 0.31 per cent, at 63.84. The rupee has lost 32 paise, or 0.50 per cent, in five trading days. It moved in a range of 63.80 and 63.94 per dollar during the day. The dollar index was trading lower by 0.60 per cent against its major global rivals on Monday. In New York market, the US dollar ended higher against the basket currencies, after Greece failed to strike a deal with its lenders, taking it a step closer to a debt default and exit from the Eurozone. Meanwhile, oil prices in Asia fell on Monday, tracking the sell-off in global equity markets on fears of a Greek debt default, analysts said. The US benchmark West Texas Intermediate for August delivery fell 82 cents to $58.81 while Brent crude for August eased 70 cents to $62.56 in late-morning trade. The benchmark BSE Sensex recovered from initial sharp losses but ended lower by 167 points, or 0.60 per cent, on all-round selling pressure from operators as stocks fell across the globe on worsening economic crisis in Greece and odds of a default increasing after the country announced plans for a referendum on its bailout conditions. In the forward market, the premium ended lower on receivings from exporters. The benchmark six-month premium payable in November eased further to 189-191 paise from last weekend's level of 191-193 paise and those maturing in May, 2016 contract fell to 415-417 paise from 454-456 paise. The RBI fixed the reference rate for the dollar at 63.9170 and for the euro at 70.4110. The domestic currency dropped further against the Japanese unit to 51.95 per 100 yen from 51.53 previously.